Whew, casting has been weirdly chaotic this week -- it's mostly due to the disjointed schedule. But it's getting sorted out. I'm trying to figure out how the Kit Kat Klub works. It's going to involve a lot more drapy stuff. We have all that gold-and-black silk from Millennium Crisis. 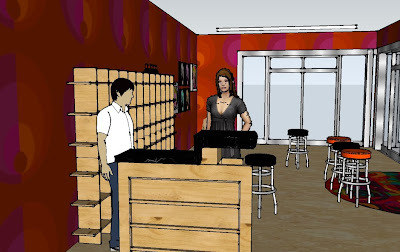 Here I am trying Google Sketchup to "visualize" the Kat Klub.